One cast iron dutch oven does it all! BBQ, deep frying, searing, simmering, braising and baking etc. The flanged lid can hold hot coals and flips over for griddling. It can also be a frying pan for meat and meals. Three integral legs keep the oven over the hot coals at a great distance. Durable handle allows you to hang it over the open fire for better cooking. And don't forget! You also got an extra lid lifter. 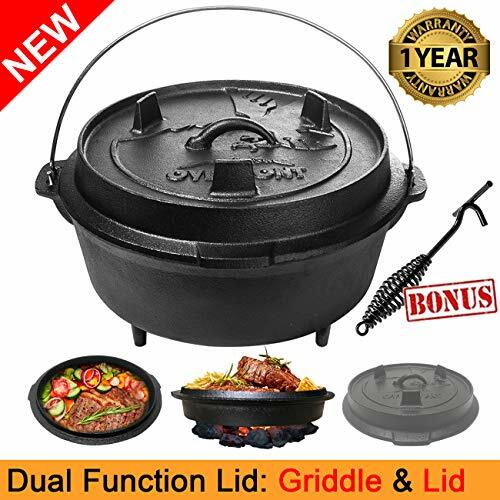 Backyard, farm corner, camping wild, you will be sure to have a good time with Overmont Dutch Ovens.Once you understand how to clean, and season a cast iron dutch oven, it will last a lifetime. Overmont Dutch Ovens comes pre-seasoned and ready to use, so you can make your family's favorite recipes right away. It can be used on any heat source, from the stove top to the campfire (microwave not allowed). But if you didn't dry it completely, it may get rust. Don't worry, just simply scour the rusty areas with steel wool, follow the seasoning steps and it will turn to be a brand new one. 1. Start by rubbing a thin coat of coconut oil or lard all over the entire surface. Rub off any excess with a cotton cloth or paper towel. 2. Preheat your oven to 450 degrees and place a baking sheet or piece of aluminum foil on bottom rack to catch any drips. Place the pot upside down in the oven and heat for 30 minutes. Turn the oven off and let it cool to room temperature. Or you can just put it in fire and heat. 3. Repeat step 1andamp;2 several times to help season the pot faster. Although, the best way to get a really good "season" is to simply USE it. Each time you use it you are seasoning it. All-round Dutch Oven. The integral legs on both pot and lid allows the oven sit perfectly over the campfire, also make the lid a great griddle to fry meals. Moreover, cast iron pots are not coated in toxic chemicals, safe non-stick surface and can be used both on the stove and in the oven. Well Known as a Lifetime Pot. Compared with pots of other materials, Overmont dutch ovens are made of high quality cast iron, will last a lifetime (or more) if cared for properly. It can be a family pot also save much money for you. Energy-saving and Environmental Protection. Heat is evenly distributed and held, making it great for deep frying, searing, and baking. It also has the advantages of heat insulation and better sealing performance, so even a new camper can do great delicious roasted chicken with this pot. Intimate Lid Lifter. Considering the great weight of cast iron, Overmont equips a lid lifter for each of the dutch oven. Besides, the durable handle allows you to hang it over the open fire. We also design an eagle pattern on the lid as our Logo which means freedom, power, strength and desire for life. HOW TO CARE：Once you are done cooking on Overmont dutch oven, cleanup is pretty easy. Make sure to dry it completely after clean. While the pot is still warm, lightly oil the inside of the pan with your oil of choice. Again, a super thin coat is all you need. Use a cloth or paper towel to rub off any excess. Overmont dedicated to provide the best sporting experiences for the new generation outdoor sports enthusiasts. Please feel free to get in touch if you have any issue. If you have any questions about this product by Overmont, contact us by completing and submitting the form below. If you are looking for a specif part number, please include it with your message.